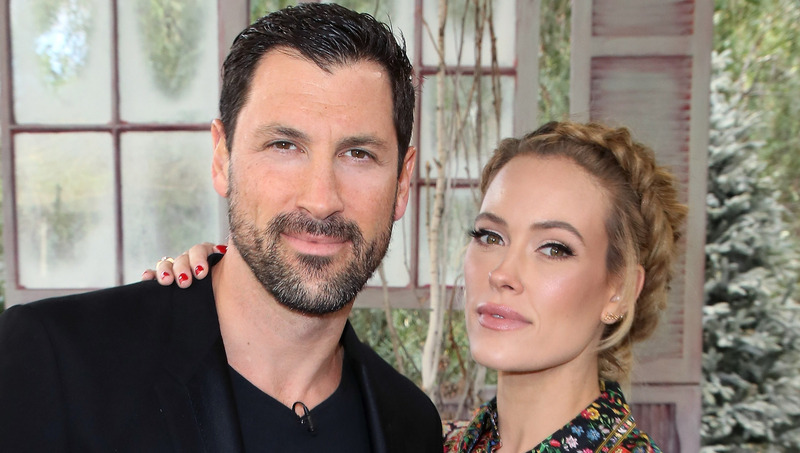 Peta Murgatroyd and Maksim Chmerkovskiy are most recognizable for their killer dance moves and winning performances on Dancing with the Stars. But ever since the birth of their 1-year-old son Shai, the pair has been focused on the role of (relatively) new parents rather than collecting dance awards like nobody's business. In fact, Murgatroyd and Chmerkovskiy are so smitten with Shai, they hate leaving the house because it means kissing his adorable face goodbye. "We can’t leave the house and that’s why we don’t go to a lot of [events], because Shai’s at home," Chmerkovskiy told ET in an interview at the Industry Dance Awards. Chmerkovskiy went on to explain that once he and Murgatroyd are home, they just want to stay in and hang out with Shai. "It’s tough," he said. "We pull out and [Peta’s] like, 'Babe, we’re not going again. We’re dressed up, we’re in the car…'"
But it sounds like Shai is totally fine with his parents' work-parenting balance. Murgatroyd recently finished filming her first movie, and Chmerkovskiy travels to check on his Dance With Me dance studios. "He is older now and he knows when Mama and Papa get in the car, and we do the wave off, he doesn't just burst into tears." Murgatroyd told ET. He is like, 'Oh, Mom and Dad are actually going. OK, they’re going to come and see me tomorrow.'" The couple is considering having more children, but for now, they're just relishing their time with Shai. "We are trying to deal with the ups and downs and all that stuff, but it has been amazing doing that teamwork thing we talk about — that joint parallel, to dance as a couple — and be in that partnership in life," Chmerkovskiy said. It sounds like the pair's amazing dance partnership translates to real life, and we love their honesty about what it's like to be working parents.